In sexually reproducing organisms (i.e. higher plants, such as coffees), species consist of individuals that can breed with each other to produce viable offspring. A botanical variety is a rank in the taxonomic hierarchy below the rank of species and subspecies and above the rank of form (form / variety / subspecies / species / genus / etc.). It will have an appearance distinct from other varieties, but will hybridize freely with those other varieties. Another meaning, as used by plant breeders and in legal texts, is synonymous with cultivar and can have legal implications. Cultivated variants of a species originating through human influence. These could be selected from existing cultivated stock or from wild populations. It is a systematic group of cultivated plants that is clearly distinct, uniform, and stable in its characteristics and which, when propagated with the appropriate methods, retain the same characteristics. The offspring of two plants or animals of different species, varieties, cultivars, or lines. A hybrid plant is formed by cross-pollinating plants of different types. The strictest sense of this definition considers hybrids only crosses between different species (compared with crosses within individuals of the same species). The deliberate breeding of two different individuals resulting in offspring that carry a portion of the genetic material of both the parent individuals. The parent individuals involved in the cross may be from species that are closely related or from different varieties. The botanical genus colloquially referred to as the “coffee genus,” which is comprised of over 120 individual species. These are generally opposite-leaved, evergreen shrubs or small understory trees with a horizontal branching pattern. They contain a pair of seeds, flat on one side and convex on the other, with a groove on the flat side (i.e., “coffee beans”). 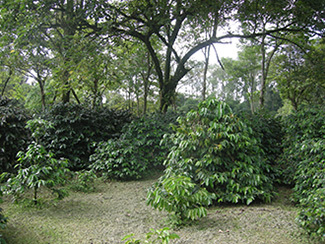 The preferred habitat of most plants in the Coffea genus is tropical forests. The botanical genus and species name for Arabica coffee, otherwise written as C. arabica. Originated in the forests of Ethiopia and South Sudan, then famously spread throughout the world for the production of its seeds. 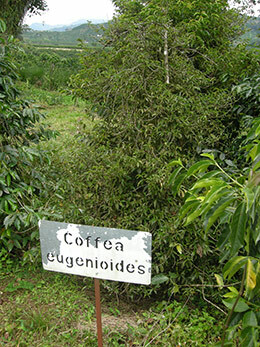 The botanical genus and species name for Eugenioides coffee, otherwise written as C. eugenioides. Indigenous to the highlands of East Africa, including the Democratic Republic of Congo, Rwanda, Uganda, Kenya and western Tanzania. Famously known to be one of the two diploid parent plants of C. arabica. It has a lower caffeine content than C. arabica. The botanical genus and species name for Robusta coffee, described over 100 years after C. arabica. One of the two diploid parent plants of C. arabica. Originated in western and central sub-Saharan Africa. A largely productive commercial crop distinct from Arabica by physical and chemical attributes, including higher productivity and caffeine content. Coffea arabica, which is indigenous to Ethiopia and some neighboring lands, first was transported out of its homeland into neighboring Yemen. From Yemen, coffee was transported around the world. The coffees that we call typicas today originated from plants that left Yemen and were taken to Java and outlying Islands, possibly by the Dutch, possibly with some transport by the mythical monk Baba Budan. The coffees we call Bourbon today stem from plants transported to Ile Bourbon with the French. Both of these epic journeys may have involved a very small number of coffee plants or seeds. Typica: This is a tall cultivar of Coffea arabica, originating from the coffee brought to Java from Yemen (possibly via India). The plants most similar to what we today call Java were spread from the island of Java in the early 1700s. It has bronze-tipped young leaves, and the fruit and seeds are large. Typica plants are known to have relatively low productivity and are susceptible to all main pests and diseases. Bourbon: A common cultivar C. arabica that naturally developed naturally on Île Bourbon (an island in the Indian Ocean, east of Madagascar, now known as Réunion) from coffee brought to the island from Yemen by the French. Depending on the specific sub-group, this coffee can be red (Vermelho) or yellow (Amarelo). These plants generally have broader leaves and rounder fruit and seeds than Typica varieties. Stems are stronger and stand more upright than Typica. They are susceptible to all major diseases and pests. Java: A Typica selection suspected to be the progeny of coffee introduced from Yemen to the island of Java. From Java, this plant was first brought to neighboring islands (Timor) and later to East Africa (Cameroon), where it was released for cultivation in 1980. It has since been introduced in Central America by the Centre de Coopération Internationale en Recherche Agronomique pour le Développement (CIRAD). It is known to be vigorous with moderate yield and shows good resistance to coffee berry disease in Cameroon. 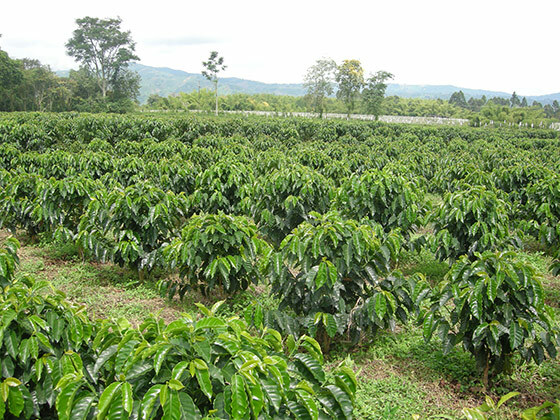 Java has elongated fruit and seeds and bronze-colored young leaves. Maragogype: A mutant of Typica, first recognized in Brazil in 1870. It produces large cherries, long, slightly twisted seeds, long internodes, and large leaves, and a relatively lower yield. Kent: A tall Typica selection that likely arose on or from coffee bred on the Kent Estate in India. It has been widely planted in India since the 1930s and a selection from this cultivar, known as K7, is more common in Kenya. It is known as the first coffee selected for rust resistance. A natural mutation of Bourbon that originally occurred on Réunion, first described in 1947. It presents with a dwarf stature and a “Christmas tree” (pointed) shape. It has smaller leaves, internodes, and seeds compared with the original Bourbon varieties. It is also known to have a lower caffeine content than many other C. arabica varieties. It is known to be very susceptible to leaf rust. Some Laurina mutants were the first varieties to be patented by the roasting industry. A tall cultivar selected and bred by Scott Labs in Kenya, considered by many to be a Bourbon-type cultivar. It has been widely reported to be an Ethiopian selection brought from Tanzania due to its relative drought tolerance, although its exact parentage is not widely known. It grows vigorously, produces a moderate yield, and is susceptible to all main diseases and pests. It is most widely grown in Zimbabwe. 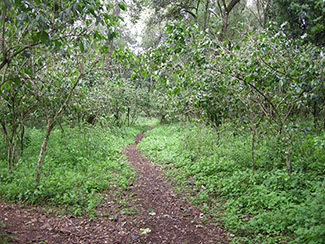 A tall cultivar selected from Bourbons by Scott Labs in Kenya. Its exact parentage is not known, although some consider it to be a simple Ethiopian selection, while others believe it is a mutation of Bourbon. It is known to be heartier and more pest and disease resistant than SL28. This culltivar shows high productivity in drought and other extreme climate conditions. It has wide leaves with bronze tips. It is one of the main varieties grown in Kenya. A selection of Bourbon developed in El Salvador. It presents with small fruits and seeds, and has low productivity. A dwarf mutation of Bourbon found in Costa Rica and released in 1957. It is known to be susceptible to most pests and diseases. A dwarf mutation of Bourbon found in 1949 in the Santa Ana region of El Salvador. Performs well at high elevations and has good yields. It was one parent in the cross that created the Pacamara cultivar in El Salvador. It is known to be susceptible to all main diseases and pests. A cross between Maragogype and Pacas developed in El Salvador. Similarly to Pacas, it is known to be susceptible to all main diseases and pests. Pacamara was released in 1958 but is genetically unstable, with 10-12% of plants reverting to Pacas. A pure-line dwarf mutant of red Bourbon that has short internodes. It was found in 1937 in Brazil, and is highly productive. Its leaf and fruit characteristics are similar to Bourbon varieties, and can produce red or yellow cherries. Like Bourbon, it is known to be susceptible to all main diseases and pests. Thought to be a dwarf mutation of Bourbon, as it has a dwarf stature and is genetically very close to Bourbon. It produces round cherries and seeds. Likely named for the port of Mocha in Yemen, it was grown in Yemen and brought to Réunion. A tall plant with features similar to those of SL28, bred for rust and CBD resistance by the Kenyan Coffee Institute and released in 2010. It was developed by backcrossing SL28 and SL34. Young leaves present with medium purplish-to-bronze coloration. Acaia: A selected cultivar of Mundo Novo mainly grown in Brazil. The plant exhibits large fruit and seeds. Mundo Novo: This tall cultivar was selected from a natural cross of Sumatra (Typica) and Red Bourbon in Brazil in the 1940s by the Instituto Agronômico de Campinas (IAC). It has a good productivity but some susceptibility to main pests and diseases. Catuai: A pure-line cultivar developed by the Instituto Agronômico de Campinas (IAC) in Brazil, Catuai originated from a hybrid between Mundo Novo and yellow Caturra. Released in 1968, it is characterized by a dwarf stature (from Caturra) and either yellow or red cherries (Catuai-amarelo and Catuai-vermelho, respectively). It has good productivity and susceptibility to all main pests and diseases. Hibrido de Timor (Timor Hybrid): A spontaneous cross of C. canephora (Robusta) and C. arabica var. Typica that occurred naturally on the island of Timor in Southeast Asia. These “Arabusta”-type hybrids likely originated from a single Robusta parent plant. It became popular in Timor in the 1950s due to its natural resistant to leaf rust. These hybrids were collected in Timor in 1978 and planted on the islands of Sumatra and Flores shortly thereafter, and since then some changes and mutations have occurred. Different versions of this hybrid have been utilized in breeding programs to introduce the rust resistance into new varieties, such as Catimor, Sarchimor, and Colombia. Catimor: A group of pure-line cultivars originating from crosses between Hibrido de Timors and Caturra. It has been distributed since the 1980s. It is known to be highly productive and shows resistance to coffee leaf rust and to coffee berry disease (CBD). One of the first widely available Catimor varieties was CR (Costa Rica) 95, released around 1995. Others include Catimor 129 and Catimor F6. Colombia: A cultivar bred by mixing various Catimors, released around 1985. It is known to have a resistance to leaf rust. Due to its breeding composition, it is known to be relatively unstable as a consistent cultivar. In Colombia, it has been popular to replace this coffee with Castillo. Icatú: A tall cultivar developed in Brazil. A hybrid between an interspecific C. canephora hybrid and red Bourbon. It was released in the early 1990s by the Instituto Agronômico de Campinas (IAC). It is the result of a cross between a C. canephora with artificially double chromosome number with Bourbon Vermelho, then back-crossed to Mundo Novo. It is known to be highly productive and shows resistance to leaf rust. IHCAFE 90: A Catimor cultivar developed at and named for the Instituto Hondureño del Café in Honduras, grown in Honduras beginning in the 1980s. 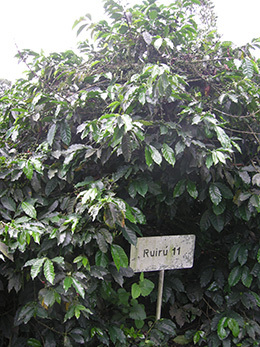 Ruiru 11: A dwarf hybrid cultivar produced by hand pollination that was the result of a breeding program in Kenya during the 1970s and 1980s, released in 1985. It was created based on need for pest and pathogen resistance. It is a cross between Catimor and multiple coffee berry disease resistant varieties, including K7, Rume Sudan, and SL28. Anacafe 14: Maragogype or pacamara cross with timor hybrid by anacafe. Rust resistance. Sarchimor: A group of pure-line cultivars originating from a cross between Villa Sarchi and one Hibrido de Timor. Sarchimor lines such as IAPAR 59, Tupi or Obata show good resistance to coffee leaf rust; some are also resistant to coffee berry disease. Castillo: A selection of the Colombia cultivar that has become the most commonly grown coffee in Colombia. It is preferred to Colombia due to its reputation for resistance to leaf rust. Oro Azteca: A dwarf Catimor selected by the Instituto Nacional de Investigaciones Forestales, Agrícolas y Pecuarias (INIFAP) in Mexico. It was released in 1996-1997. It has similar rust resistance to most Catimors. Has UPOV variety designation. Jember/S795: This cultivar was developed by Indian breeders using Kent and Coffea Liberica hybrids in the 1940s. It is named for the Jember Indonesian Coffee and Cacao Research Institute (ICCRI), whose staff first introduced it to coffee famers in Indonesia. It is widely grown in India and Indonesia and originally exhibited some resistance to coffee leaf rust though that resistance is reported to have diminished over time. Some describe its taste as having maple syrup or brown sugar attributes. Gesha: A wild Ethiopian coffee now cultivated widely in Central America. It is named for a town in Western Ethiopia where it is thought to originate. It was brought from Ethiopia to the Centro Agronómico Tropical de Investigación y Enseñanza (CATIE) in Costa Rica. From there, it made its way to the Boquete region of Panama, where it was made famous by the Peterson family of Hacienda La Esmeralda. It is widely known for its outstanding cup profile. It is susceptible to leaf rust. Also a cultivar released by the JARC/EIAR in Ethiopia. Wintgens JN. 2009. Coffee: Growing, Processing, Sustainable Production, 2nd ed. Weinheim: Wiley-VCH Verlag GmbH & Co. KGaA. Ukers W. 1922. All about coffee. New York: The Tea and Coffee Trade Journal Company. Jobin P. 1982. The Coffees Produced throughout the World. Le Havre: P. Jobin and Co. Specialty Coffee Association of America. 2013. Coffee Biology Field Glossary. California: SCAA. Clifford MN, Willson KC. 1985. Westport, CT: AVI. Rothfos B. 1980. Coffee Production. Germany: GORDIAN-Max-Rieck GmbH. Questions or comments? Please email research@sca.coffee.